This student-friendly study guide offers a clear, concise, and complete explanation of contract law through skillful use of multiple-choice questions. Addressing all topics covered in standard first-year contract courses—and more-- it provides an expository review of key points of law and illustrative scenarios, followed by probing multiple-choice questions. Systematically, step by step, all possible answers are deconstructed through careful explanation and analysis, leading students through the logic of why the correct answer was correct and, importantly, why the others were not. 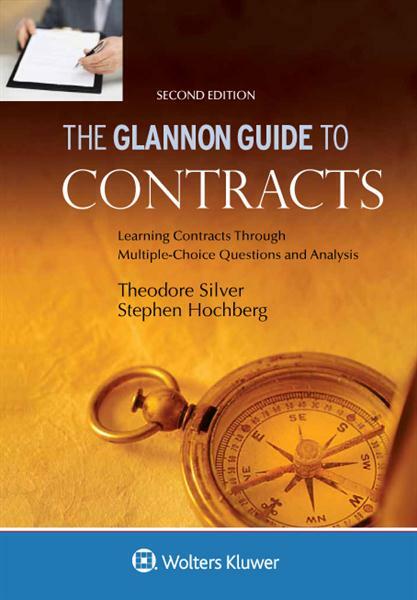 Important test-taking techniques and tactics receive thorough coverage throughout the text, making The Glannon Guide to Contracts an invaluable aid for first-year students trying to navigate the complexities of contract law. This book leads you exhaustively through all issues covered in every first-year contracts course. The questions are of the sort that students will encounter on tests in the typical Contracts course, and on the bar exam as well. Detailed explanatory analyses help students answer their questions and resolve potential misunderstandings. Well-written, with a light, readable tone and realistic examples. A thorough, expository review of the key points of law precede all questions and prepares students to answer and learn from the multiple choice questions it incorporates. All answers are deconstructed through clear, elaborate analyses showing why the right answer is right and the wrong answers are wrong. Each chapter concludes with a “Closer,” a particularly challenging question that encourages students to push their mastery of the topic to a more sophisticated level. “Closing Closers” appear in the book’s final chapter, cumulatively addressing all concepts covered in the text.